Wedding games are an integral part of wedding planning and are particularly important to the Wedding MC and the wedding planners when they get together to create a fun reception. In fact, wedding games are one of the hottest reception trends these days. And why shouldn’t they be? After all, almost two-thirds of guests remember the entertainment – which includes wedding games – at the reception. And that has a direct impact on how they perceive the overall wedding experience. Amazingly, wedding games are almost as important in creating a fun experience at the reception as the thousands of dollars you and your family spend on the venue, decorations, catering, cake, centerpieces, and favors! 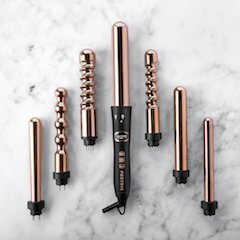 For the most part, wedding games are part of the bride’s wedding reception planning although they can include games played at wedding showers and pre-wedding events. Wedding games are all about having FUN at the reception. In this article, though, I’ll talk about wedding reception games because they’re one of the key components of the Wedding MC Duties. 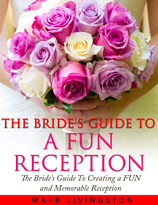 Here are 3 Wedding Games Tips to help you plan and create a fun reception. The formality of the reception and the age ranges of the guests may determine which wedding games you choose at the reception. Formal attire. High heels. They will all dictate the type of wedding games you’ll be able to choose. More formal receptions might not have many wedding games and instead choose other activities with which to entertain the guests. It might seem self-evident that wedding games should be fun. But some wedding games might seem like they will be fun to play but they don’t work out that way at the reception. So gauge the mood and tempo of the reception. If the tempo of the reception is waning, consider introducing a game that has upbeat music to it. You don’t want to have games at the reception that are complicated. Instead, choose games that are easy to understand and easy to follow by all of the guests. The “Newlywed Game” is one wedding game you might want to use at your reception. The “Newlywed Game” is a common wedding game for indoor receptions that is played by the bride and groom. It’s very entertaining for the guests if the right questions are asked and the event is coordinated properly by the Wedding MC. The Wedding MC asks the bride and groom a series of questions to which the bride and groom answer with colored shoes (white for bride, black for groom) to signify to whom the answer pertains. Fun wedding games are those that are relatively short in duration, require guest participation, and are easy to play. How To Be A FUN Wedding MC provides an exciting list of Wedding Games for the master of ceremonies and wedding planners to help them plan a fun reception. 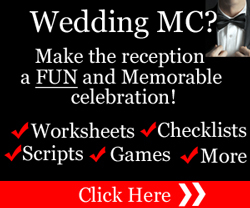 Keep in mind, though, that wedding games are only part of planning a reception – especially if you’re a Wedding MC. There are many more areas you have to attend to before and during the reception. 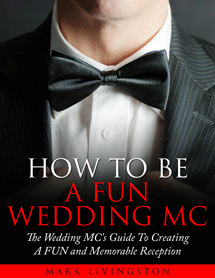 If you’re a novice or first-time Wedding MC, take a moment to look at How to Be A FUN Wedding MC. You’ll find out how it can help you create a reception using wedding games and entertainment ideas that make the reception not only fun but also fondly remembered by the bride and groom for years to come.